The Village at Regal Pond will soon have a new sushi restaurant. Izumi Sushi has pulled permits for an interior remodel and new sign for the former Wheat Montana/West Wing/Cafe Italiano restaurant location. Inland Northwest Business Watch reported in August that they had applied for a liquor license. The City issued the permits for remodeling on October 17th. Java junkies take heart! Cool Beans Espresso Stand is relocating ahead of the construction of the Maverik gas station at 44th and Regal. Back in July the stand was served with an eviction notice ahead of the gas station construction. 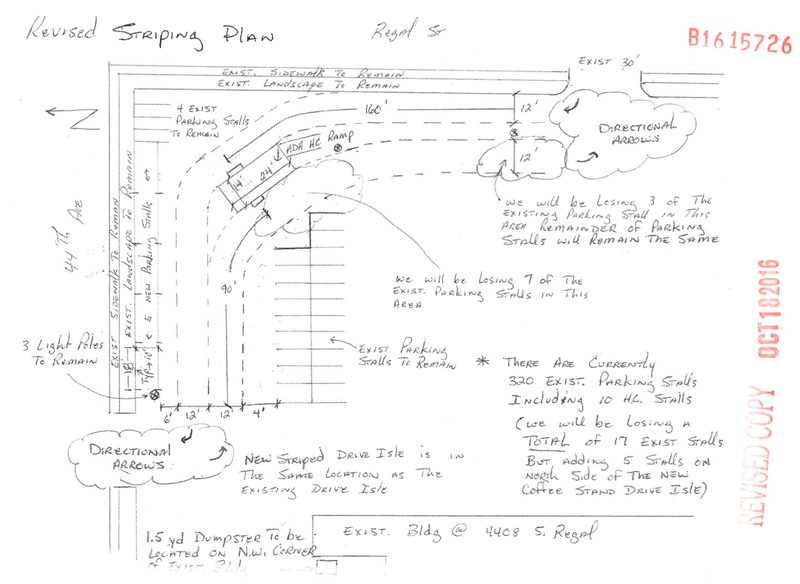 These are the approved plans for the new Cool Beans espresso stand location at the southwest corner of 44th and Regal. Building permits issued by the City last month show that Mr. Douglass is moving the stand across the intersection of 44th and Reagl to the northeast corner of the parking lot of the Ace Hardware shopping center where the Spokane Boys fruit and Christmas tree lots are located seasonally. Mr. Douglass owns both the Ace shopping center and the open land at 44th and Regal where the gas station will be built. None of the submitted documents include a timeline for the building of either the espresso stand or the gas station. We will update you when we hear more.